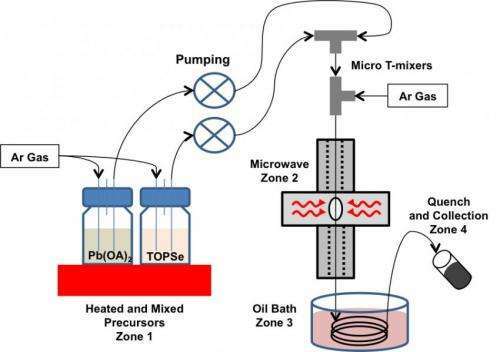 Engineers at Oregon State University have successfully shown that a continuous flow reactor can produce high-quality nanoparticles by using microwave-assisted heating – essentially the same forces that heat up leftover food with such efficiency. Instead of warming up yesterday's pizza, however, this concept may provide a technological revolution. It could change everything from the production of cell phones and televisions to counterfeit-proof money, improved solar energy systems or quick identification of troops in combat. The findings, recently published in Materials Letters, are essentially a "proof of concept" that a new type of nanoparticle production system should actually work at a commercial level. "This might be the big step that takes continuous flow reactors to large-scale manufacturing," said Greg Herman, an associate professor and chemical engineer in the OSU College of Engineering. "We're all pretty excited about the opportunities that this new technology will enable." Nanoparticles are extraordinarily small particles at the forefront of advances in many biomedical, optical and electronic fields, but precise control of their formation is needed and "hot injection" or other existing synthetic approaches are slow, costly, sometimes toxic and often wasteful. A "continuous flow" system, by contrast, is like a chemical reactor that moves constantly along. It can be fast, cheap, more energy-efficient, and offer lower manufacturing cost. However, heating is necessary in one part of the process, and in the past that was best done only in small reactors. The new research has proven that microwave heating can be done in larger systems at high speeds. And by varying the microwave power, it can precisely control nucleation temperature and the resulting size and shape of particles. "For the applications we have in mind, the control of particle uniformity and size is crucial, and we are also able to reduce material waste," Herman said. "Combining continuous flow with microwave heating could give us the best of both worlds – large, fast reactors with perfectly controlled particle size." The researchers said this should both save money and create technologies that work better. Improved LED lighting is one possibility, as well as better TVs with more accurate colors. Wider use of solid state lighting might cut power use for lighting by nearly 50 percent nationally. Cell phones and other portable electronic devices could use less power and last longer on a charge. The technology also lends itself well to creation of better "taggants," or compounds with specific infrared emissions that can be used for precise, instant identification – whether of a counterfeit $20 bill or an enemy tank in combat that lacks the proper coding. In this study, researchers worked with lead selenide nanoparticles, which are particularly good for the taggant technologies. Other materials can be synthesized using this reactor for different applications, including copper zinc tin sulfide and copper indium diselenide for solar cells. New Oregon jobs and businesses are already evolving from this work. OSU researchers have applied for a patent on aspects of this technology, and are working with private industry on various applications. Shoei Electronic Materials, one of the collaborators, is pursuing "quantum dot" systems based on this approach, and recently opened new manufacturing facilities in Eugene, Ore., to use this synthetic approach for quantum dot enabled televisions, smartphones and other devices.